Hibernian manager John Hughes has challenged his players to maintain the form that has earned the team third place in the Scottish Premier League. "I've said I want third spot in the league and a European place for next season," said Hughes. "It's up to the players to go and do it. So far I have had a great response. We'll keep battling away and see where it takes us." Hibs can move ahead of second-place Celtic if they win their game in hand. The Easter Road boss is delighted that his players have handled the pressure of keeping in touch with the Old Firm, but says the onus is now on them to finish the job they have started. "We said 'let's get through Christmas and the transfer window and see where we are'. We have done that," Hughes added. "If you had seen us pre-season when I first came in and said that, in the first week of February, if you win your game in hand you'll overtake Celtic, I would have laughed at you. "But our defensive record has been very good and the three boys in midfield - (Kevin) McBride, (Liam) Miller and (John) Rankin - are dynamos that give us the platform to go and play. "You have to get the balance right." Despite his team's lofty league position, Hughes insists the Edinburgh club still has a long way to go to catch the big two ahead of them. "I still feel that the Old Firm are miles and miles in front of us," he argued. "Take Celtic bringing in Robbie Keane. I thinks it's absolutely fantastic for Scottish football and a great signing for the game up here." This weekend Hibs are in action in the Scottish Cup and Hughes says that new signings Alan Gow and Mark Brown will go straight into the squad for Saturday's fifth-round tie against Montrose. 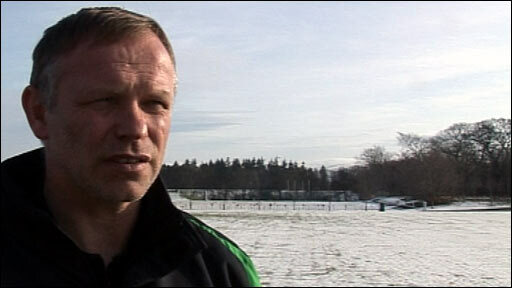 Hughes told BBC Scotland that he was "thankful" to the Hibs board and chairman for being active in the transfer window. And he is looking forward to attacker Gow, his former player at Falkirk, wreaking havoc on the opposition. "I used to just say to Gowser, 'there's your strip, just go and play'," Hughes recalled. "He can play anywhere across the front line, drop back into midfield. With Gowser, you need to cuddle him and get him playing with a smile on his face. I'm delighted to bring him to my club." Gow has had a difficult time since leaving the Bairns for Rangers, where he did not establish himself in the first team, and has endured disappointing spells at Norwich, Blackpool and Plymouth, from whom he is on loan. The player said of Hughes: "He'll tell you the truth and a lot of managers aren't very honest, I can tell you. "The training's different class and the way they want to play football is the way maybe I think it should be played." 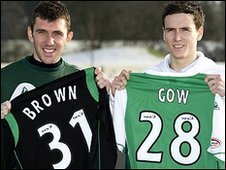 Goalkeeper Brown, his new team-mate in Leith, is another player joining Hughes' band of players seeking first-team football. Frozen out at Celtic, the former Rangers, Motherwell and Inverness goalie was on loan at Kilmarnock when Hughes came calling. "The chance to get to work with him was too good to turn down," said Brown of his new boss. "There's a great spirit here. In the last couple of games they have got goals in the last minute. That shows the winning mentality. They are not happy just to get a point; they push to the last minute to get a winner." Brown will compete with Graeme Smith, Yves Ma-Kalambay and Graham Stack for the number one jersey. He added: "If you want to be a successful team, then you must have a strong squad, but I look forward to challenging the other guys for a place in the team."